Between the North Cascades and the Rocky Mountains in northeast Washington state is an area called the Columbia Highlands. Subalpine peaks and roadless forests of pine and larch dot the crest of the Kettle River Mountain Range in Ferry County and the Selkirk Mountains in Pend Oreille County. Below these high points, rolling conifer forests, ranch lands and gentle river valleys transition into the steppe of the Columbia Basin and Okanogan Highlands. Much of this land is managed as the Colville National Forest, while areas of state, private and tribal land also abound. The Columbia Highlands includes diverse habitat for wildlife, from wolves, lynx and grizzly bears to mountain caribou, elk, moose, white-tailed and mule deer, bighorn sheep, and dozens of species of migratory birds and other native species—much the same mix of wildlife as 200 years ago. The Columbia Highlands region connects the Cascades to the Rockies. As climate changes and additional habitat is lost to development, protecting northeast Washington’s wildlands and maintaining connected paths between habitats in the Columbia Highlands becomes even more essential. A map of wild Inventoried Roadless Areas (IRAs) and wilderness-quality lands on the Colville National Forest in northeast Washington’s Columbia Highlands. Map: Amelia Tiedamann. Follow us at Columbia Highlands Wilderness on Facebook for the latest updates! Here the mystique of the American West lives on. Historic valley-bottom ranches maintain habitat and open space. Wildlands teem with abundant and diverse wildlife and locally-owned timber mills provide family-wage jobs and wood products. The region’s mix of wildlands, ranches and working forests represents a network of wildlife habitat that keeps the Cascades and the Rockies connected for wide-ranging wildlife like wolves, lynx, grizzly bears and other wildlife. Excellent hikes abound in the Columbia Highlands! The Kettle Crest Trail and Abercrombie Mountain are some of our favorites. 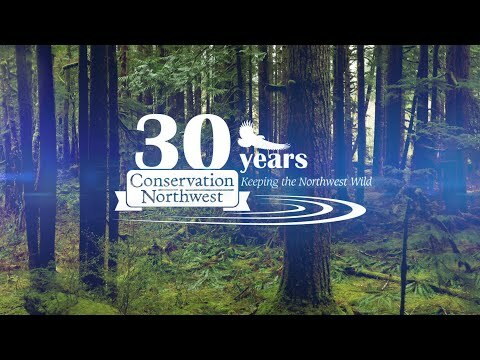 Since 2002, we’ve worked in the Northeast Washington Forest Coalition, a unique collaboration with timber industry leaders, private landowners, small business owners, public agencies, conservation and recreation groups, and community leaders to conserve thousands of acres of wildlife habitat in the Columbia Highlands on both public and private lands. In 2010, Conservation Northwest put forward our Columbia Highlands Initiative legislative proposal intended to engage local stakeholders and elected officials to work together and come up with a balanced plan that included restoring forests and creating jobs, protecting working ranches and wildlife habitat, and designating new wilderness, recreation and conservation areas. Collaborating with local forestry businesses and other stakeholders is an important aspect of our work in the Columbia Highlands. Learn more on our webpage or watch the 2010 documentary series From Controversy to Common Ground. With a Congress that seems unable to act on many of the nation’s top priorities, including common ground conservation and natural resource policy for northeast Washington, moving forward with a community-based plan for protecting these wild places and improving forestry on public lands to benefit local communities and wildlife has been challenging. Since the mid-2000’s, our Columbia Highlands Initiative has made great strides toward greater collaboration, improving forestry practices on the Colville National Forest and safeguarding working ranchlands that provide important habitat for wildlife. Through the Northeast Washington Forest Coalition and other avenues, we’ve also moved forward on informing the Colville Forest Plan. We’ll keep looking for opportunities to work with the U.S. Forest Service, local community leaders and members of Congress to advance a balanced plan for the Columbia Highlands that includes protecting wilderness and supporting sound forestry that benefits local communities and wildlife. While we wait for the right opportunity to protect wilderness in the Kettle Range and Selkirk Mountains, we have shifted our focus in the Columbia Highlands toward other wildlife conservation and forest restoration challenges. We will continue to rally public support for forest plan wilderness recommendations for the Kettle Crest and other wild areas and look for opportunities to engage local elected officials and stakeholders to find common ground around wilderness and other forest management issues. Learn more about the history of wilderness work in northeast Washington in our 2009 web video series Columbia Highlands Wilderness.